Place the popped popcorn and butterscotch morsels in a large mixing bowl and set aside. In a separate, large microwave-safe bowl, place the marshmallows and butter. Microwave the marshmallows and butter for 1-1/2 to 3 minutes or until the marshmallows get very puffy. Stir the marshmallow mixture until smooth and fold into the popcorn mixture. When cool, use your hands to shape the mixture into a football. 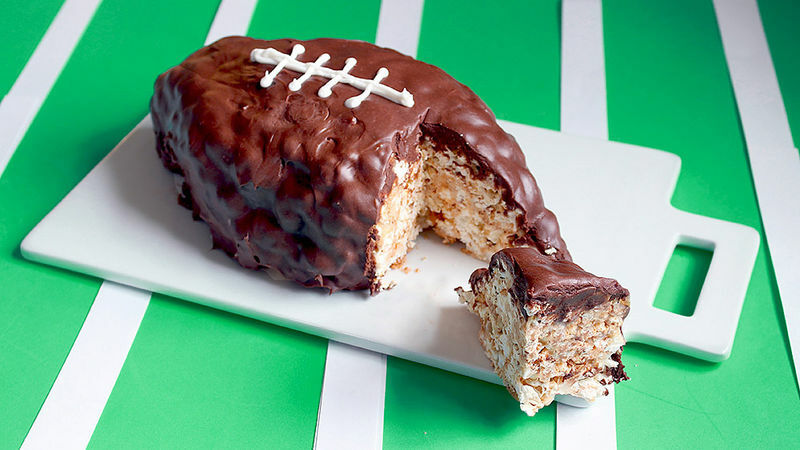 Place the football on a serving plate, laying strips of parchment or wax paper under the edges of the football to catch any extra frosting. Empty the can of frosting into a microwave-safe bowl. Microwave for 15 to 20 seconds, until the frosting is pourable but still thick. Pour several spoonfuls of frosting on the top of the football and let it slowly fall down the sides. Continue adding spoonfuls, encouraging the frosting with a spatula, until the whole football is covered. You might not use all of the frosting. Let the frosting set well, at least for 1 hour. Gently remove the strips of parchment. Use the white decorating icing to pipe the lines for the laces and markings. Have parchment paper or wax paper on hand to assist with this recipe. Basically, this cake is a big ol' popcorn ball smothered in chocolate frosting. Quick, easy and fun! This no-bake cake is so crazy good – a magical combination of salty popcorn and sweet chocolate and just the right amount of butterscotch. Plus, it looks like a football! Please serve this after your game day chili. I would actually sit through an entire football game (match? whatever) just for a slice of this cake. All you need is a bag of popcorn, some marshmallows and butterscotch chips, a bit of butter and some frosting. Oh, and a microwave. Pop a bag of popcorn (not snack size, the regular kind). You can use any flavor you like. I used salted, because salt goes so well with sweet stuff. Take out any unpopped kernels. You should be left with about 10 cups of popcorn. Pour it into a huge bowl and toss in the butterscotch chips. Now set that aside. Put the mini marshmallows and butter in a big, microwave-safe bowl. Microwave for 1 1/2 to 3 minutes, or until the marshmallows puff up like mad. Hence, why you're using a BIG microwave safe bowl. Stir the marshmallow mixture quickly until it’s smooth. It will reduce considerably. Then scrape all that good stuff into the popcorn mixture. Mix with a spatula (gently but thoroughly) until all the ingredients are combined. You’ll notice a lot of the butterscotch chips will start melting a bit and getting kind of gooey. This is good, that’s what you want. And those that don’t get gooey? That’s okay too. You want some of those in there. Now here’s the fun part! Get in there with your hands (I wet my hands a bit first so they wouldn’t stick) and shape the mixture into a football. It’s not hard at all, I promise. Move the football to your serving plate. Place strips of parchment or wax paper under the edges of the football to catch any extra frosting. Empty a can of frosting into a microwave-safe bowl and microwave for 15 to 20 seconds until the frosting is pourable but still thick. Pour several spoonfuls of frosting on the top of the football and let it slowly fall down the sides. Continue adding spoonfuls, encouraging the frosting with a spatula, until the whole football is covered. You might not use all of the frosting. You can also skip the microwave part for the frosting and just spread the frosting on with a knife, but I find it’s quicker and easier to coat a cake with frosting this way. The texture of the cake will be bumpy from the popcorn beneath, but aren’t footballs kind of bumpy, too? I wouldn’t know. Let the frosting set for at least an hour, then gently remove the strips of parchment. Use the white decorating icing to pipe the lines for the football. Then, keep hands off this football until you’re ready to slice it up!